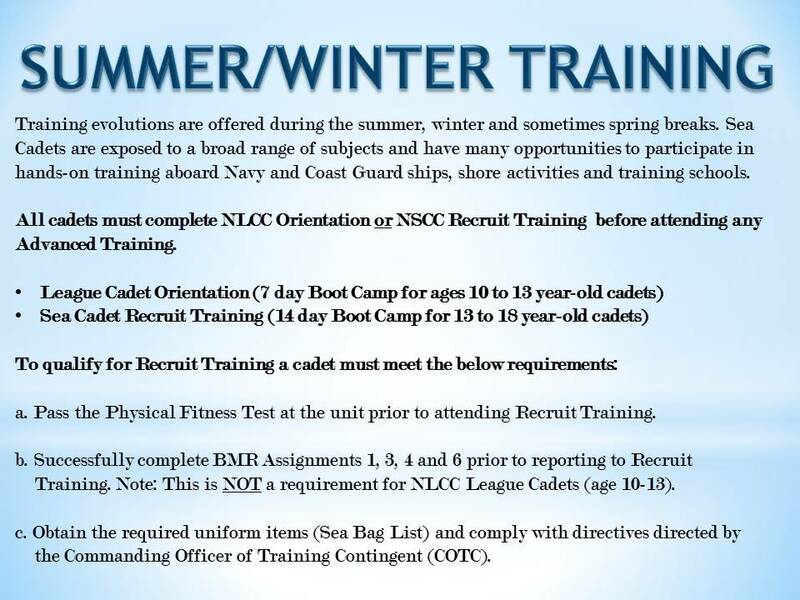 Important : Do not attempt to contact the officers or staff of the summer and winter training or send request for training directly, all requests must go through the Magellan database via our Staff. Fill out a REQUEST FOR TRAINING AUTHORITY (NSCTNG001). Parents must sign this form. Deliver completed form to your Operations Officer (OpsO). The OpsO will request a billet for you in Magellan as soon as the form is approved and signed by the Commanding Officer (CO). This form stays in your service jacket. Click on the appropriate NSCC or NLCC link and follow directions, providing supplemental information and payment. Congratulations! You have completed the training registration process. Please watch your email inbox for notices and updates. Do NOT wait until the last minute to register or to begin organizing your sea bag. As training times approach, websites are taken down and staff become unavailable to answer questions. It is the parent’s responsibility to arrange transportation for their child to and from the training site. This means from the doorstep of the individual residence to the doorstep of the training site.